AST-SEAL™ anaerobics cure within metal connections, in the absence of oxygen, and at ambient temperatures. Available in a full range of strengths and viscosities. These anaerobics fill all surface imperfections and set to a tough, durable seal across the entire surface while distributing the stress load and reducing fastener fatigue. Vibration loosening is prevented and the connection is sealed and protected against corrosion. AST-SEAL™ Anaerobic Sealants provides a solution for many industrial applications including sealing standard and stainless steel pipe for the life of the connection, sealing Hydraulic, Air and Coolant line fittings and sealing hairline weld fractures and porosities. Use right out of the bottle. Packaged in three popular sizes to fit your particular job or application. AST-SEAL anaerobics are single-component, fast-curing, and solvent-free. Eliminates the need for other mechanical locking devices. 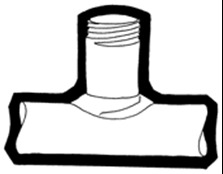 Hardening only within the joint, anaerobics do not block or contaminate the system; excess resin outside remains in liquid state and is removed easily. Improve products quality and reliability. AST-LOCK™ PRIMER T is Heptane Based and fast acting Viscosity : 3 Cps, Flash Point : 0°F, Color: Green. AST-LOCK™ PRIMER N is Heptane Based and good for general-purpose applications Viscosity : 3 Cps, Flash Point : 30°F, Color: Green. An excellent sealant for straight metal threads up to 1 "diameter created to withstand hydraulic system pressures. It also exhibits high temperature and solvent resistance to water and non-polar solvents.